Summer is ending, so blogging can be expected to pick up again (and I am well aware that I am nowhere near the blogging frequency of earlier years). On the one hand that is good, as it means that there are other parts of life that demand my time and attention (hint: marriage is good one). On the other, it leaves my readers wanting for things to read. And I still think I have some things to say, even when the blogging world, not least the Catholic blogging world, has changed over the years. I still intend to write about Catholic topics (local and international) as they develop, and in that sense it is hard to predict when I will write about what. Still, write I hope to do. While life on the whole is good, there are always concerns and worries. Lately, finances have been a bit tight, which is why, to borrow a phrase, the tin cup rattles once more. Bills need paying, food wants a place on the table… And my writing may perhaps contribute to those practical purposes. Hence my humble request for your kind donations. In return I will write, inform, hopefully inspire… and I will remember you in my prayers, at Mass and in the privacy of my home (and perhaps also in the spontaneous prayerful exclamations that slip out in times of need or surprise). This little button (or its brother in the right side bar) will take you to the right place to donate whatever amount you please. It was one of the more unexpected choices, and for the new bishop the change will be big in several ways: he goes from the north to the south of the country, from a diocese with few Catholics to one with many, from a part of the country where people are fairly down to earth, to one where the Dutch concept of ‘gezelligheid’ has a natural home and where people are sometimes brutally honest. It will be interesting to see what bishop and diocese bring each other. 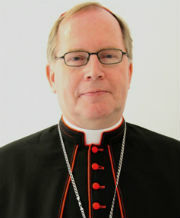 The new bishop of ‘s-Hertogenbosch is 60-year-old Gerard de Korte, until today the bishop of Groningen-Leeuwarden. And this scribe’s bishop at that. In yesterday’s blog post I already characterised Bishop de Korte as a popular shepherd. He is personable, interested, with a keen sense of the hearts and minds of other people. That makes him well suited to represent the Catholic Church in relations with other Christians, a talent he has made one of the focal points of his mission. In Groningen-Leeuwarden, such ecumenical effort is a necessity and a value. How it will take shape in ‘s-Hertogenbosch will be very interesting to see. “I wish very much that you, as a society, may live in confidence with the new bishop. You and I, we, live in a time of many and great changes. Especially now it is good to stand on the solid ground the faith offers us. God is our Creator and Father. He wanted all of us and included us in His plan of love. Secondly, I wish for you all that you may remain hopeful with the new bishop. Evil and death are in the way of us all. They supplant hope. Jesus Christ broke the power of sin and opened the way to life. We celebrate this in the Eucharist and from it we draw hope every time. With that, as a new community around Christ, we can be a sign of hope in our society. Lastly, I wish for the new bishop and you all to remain in love. That this may be the basis of your life. The Holy Spirit lives in us. He plants love in us and continuously strengthens the divine life. This makes love bloom in us. Love can reinforce our community. Love will let us live for each other in the Church and in the world. Bishop Hurmans, now bishop emeritus, closes with a word of gratitude, despite beginning his letter by saying that he has said enough about his retirement. 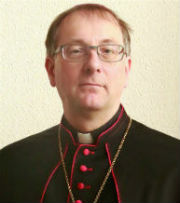 Bishop de Korte has been the bishop of Groningen-Leeuwarden since 2008. Before that, from 2001 to 2008, he was auxiliary bishop of Utrecht, where he also worked as a priest since his ordination in 1987. He is a historian and served as seminary rector before his appointment as bishop. In Groningen-Leeuwarden he was a bishop on the road, travelling to every corner and sharing the major celebrations of Easter and Christmas between the cathedral in Groningen and the church of St. Boniface in Leeuwarden. Ordinations were also shared between the two cities: those of deacons, as pictured at left, in Leeuwarden, and priests in Groningen. He leaves a diocese in the midst of the greatest reorganisation in recent history: the reduction of its 84 parishes to 19. May the vacancy of the seat in St. Joseph’s cathedral in Groningen be a short one. 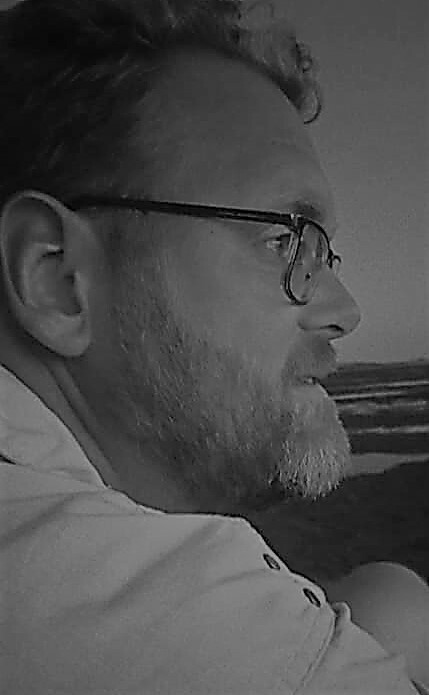 In my blog, Bishop de Korte has made frequent appearances, and translations of his writing may be found via the tag cloud in the left sidebar. Just click on the tag ‘Bishop Gerard de Korte’. Despite the appointment coming before Easter, Bishop de Korte will mark the Church’s greatest week in Groningen-Leeuwarden. His installation in ‘s-Hertogenbosch’s Cathedral Basilica of St. John the Evangelist will follow on 14 May. 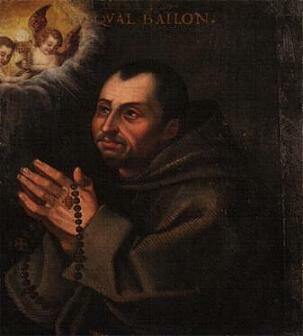 In hindsight, this was perhaps the most Franciscan option in the Netherlands. Bishop de Korte fits the profile of what Pope Francis wants in a bishop (although other bishops are often unfairly depicted as being in opposition to the Holy Father): an open communicator, close to the people, a shepherd who smells like the sheep. These qualities may go a long way in resolving the polarisation that plagues parts of the Diocese of ‘s-Hertogenbosch. In recent years more than one community has broken with the diocese, and the person and approach of Bishop de Korte, a man of dialogue and a strong voice against hate and distrust, may go a long way in setting them back on a course towards reconciliation. Bishop de Korte at an interfaith meeting against hate and racism in 2014. In his new diocese, Bishop de Korte will undoubtedly continue to stress the importance of catechesis. Back in 2012 he said, “It may sound dramatic, but I sometimes feel that only a great catechetical offensive can secure Catholicism in our country. Without it, the strength of our faith seems to continue to weaken and Catholics become more and more religious humanists for whom important aspects of classic Catholicism have become unfamiliar.” Other emphases of his new task will be ecumenism, religious life and active Catholic communities. In the Dutch Bishops’ Conference this appointment does not change much, although several commentators have chosen to see it as a blow for Cardinal Eijk, outgoing president and predecessor of Bishop de Korte in Groningen. The two prelates have not always seen eye to eye, and they have clashed on occasion, although how much actual truth there is behind the rumours will probably remain guesswork. In the conference, Bishop de Korte retains his one voice, and continues to hold the portfolios that formulate Church relations with the elderly, women and society. Actual change will only occur when a new bishop is appointed for Groningen-Leeuwarden, and perhaps not even then: if the new ordinary up north is one of the current auxiliary bishops in the country, the composition of the bishops’ conference remains the same as it is now. Now, we could make the assumption that Cardinal Eijk would have liked to see a bishop in ‘s-Hertogenbosch who was more in line with himself, but that is guesswork. And besides, as I have pointed out before, the cardinal and the bishop may have different personalities and talents, their policies (for example, about the closing of churches and merging of parishes) are not always all that different. In recent years, Bishop de Korte has appeared as the voice of the bishops’ conference, especially in the wake of the abuse crisis. This will not change, I imagine, even if the crisis has abated somewhat. Although the bishops in general remain hesitant to embrace the resources of the media, Bishop de Korte is the one whose face and name appears most frequently. He is a blogger on the diocesan website, writes books and articles and even appears on television every now and then. This is something that he should continue to do so: he is well-liked by many in and outside the Church, and knows how to communicate to both. And that is a value we need in our Church today. This blog is a labour of love, flowing from my interest in the topics I write about and the perceived interest of readers in the English speaking world and beyond. In the past weeks I have seen a surge in page views here and sharing of my blog posts on social media and in other blogs and websites (I suspect the Synod may have had something to do with that…) It is always a joy to see that happening and every link and retweet is appreciated. It is one of the reasons I keep on doing this, in between my daily chores, work, family, Church and social activities. You can also show your appreciation by donating financially, not to Her Sisterness above, but via the handy PayPal button below or in the left sidebar. Your donation, no matter how great or small, will help in my continued blogging and contribute to the upkeep of the small household I call home, the place from where I blog. In addition to my gratefulness, I will remember all donors in my prayers and am willing to pray or light a candle for any specific intentions you may have. I am also thinking of expanding into writing on assignment, so if you are interested in discussing the possibilities of that, drop me an e-mail at mr.hofer@gmail.com.